A rare stallion at Branda. In the crazy heydays of the eighties most horses were sold to the US. This stallion travelled the other way and was imported to Sweden in 1987. He was born at Tom Chauncey Arabians in Scottdale who bred many horses from *Naborr. 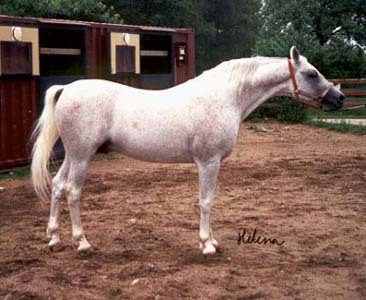 TC Kashmir was Swedish Nat'l Ch stallion in 1990. He is the sire of Kahir, a good pony racehorse, Riad el Hatani, a racehorse born in Germany, and the good broodmare Tosca. TC Kashmir ws later exported to Germany. He is from the Kuhailan mare line of Selma 1865, one of the families of Crabbet. Her daughter Sobha 1879 by Wazir was exported to England in 1891 and in 1899 to Russia. The family ws continued in England by Sobha's daughter Selma 1894 by Ahmar. Selma 1894 was the dam of Sardhana 1924 by Nureddin II, exported to Ujazd in Poland, and Star of the Hills 1927 by Raswan, exported to Tersk. Both these branches are represented in Poland today. TC Kashmir belongs to the branch of Sardhana through her daughter Rokiczana 1952 by Witraz and her daughter *Rokitka 1958 by Arax, the greatgranddam of TC Kashmir. *Rokitka was also granddam of Relax 1972, used in Poland and then imp Sweden.